ALN400G - G & W Machinery Sales, Inc. The ALN400G, Rigid Linear Motor Driven High-Performance Wire EDM Machine incorporates Sodick's next-generation SPW (Smart Pulse Wire) control with the Smart Pulse Generator and technologies that improve cutting speed and precision. The ALN also streamlines the control design, combining the best functions of both tablet interface and classic interface into a highly functional work display, improving processing responsiveness. In cutting precision fitting parts with a 3.94" (100 mm) thickness, Sodick has achieved the following; improved cutting speed, reduced cutting frequency, improved part accuracy and improved surface quality. A 32% cutting time reduction has been achieved using the ALN400G. 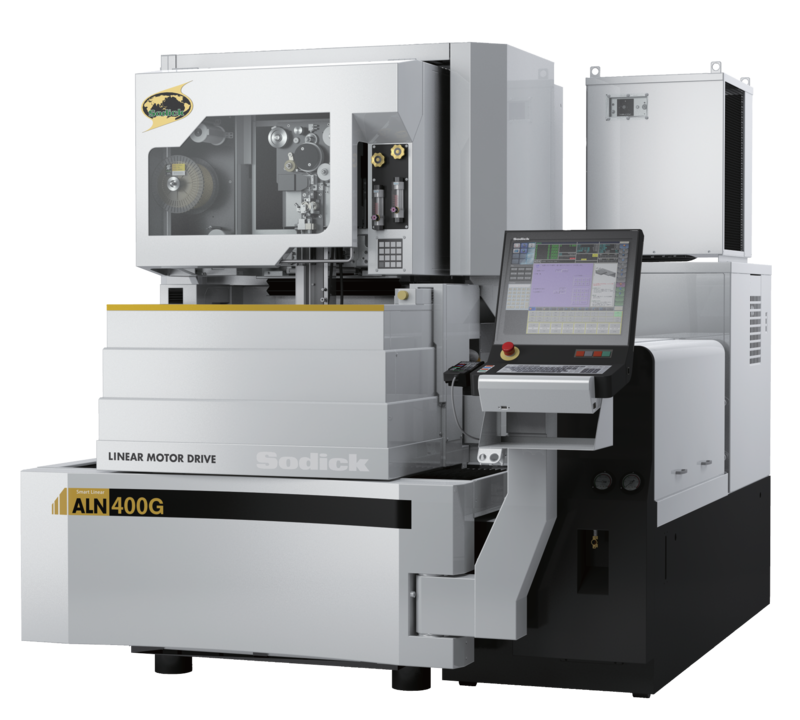 Sodick’s ALN400G rigid linear motor driven, high precision Wire EDM machine features new user-friendly EDM technology which further enhances productivity and EDM precision. The machine’s rigid linear motor axes drives are coupled with glass scales on the X, Y, U and V axes which ensure precision cutting and positioning accuracy. Sodick’s X, Y, U and V linear motor drives have no backlash and are backed by Sodick’s 10-Year Positioning Accuracy Guarantee. Sodick currently manufactures and delivers only linear motor driven machines; proving the unrivaled reliability of Sodick's own rigid linear motor technology. Sodick's rigid linear motors have the optimum flat design. The machine castings support the linear motor to achieve ideal linear performance, the ultimate design for precision machining. The new Sodick Control SPW (Smart Pulse Wire) has many attractive features, from the use of the industry standard Windows 7 operating system, to an enhanced, 19 inch horizontal TFT multi-touch screen. The ALN control design streamlines the former tablet and classic control modes into a single work screen with easy-access functions. The streamlined design also improves control processing speed, for a highly responsive user experience. This AWT system allows submerged and non-submerged threading. Combining thermal wire cut for a straighter wire and new water-jet function, the reliability of the Sodick AWT system has been further improved. The exclusive use of closed guides on the ALN400G in combination with the FJ AWT further increases productivity.